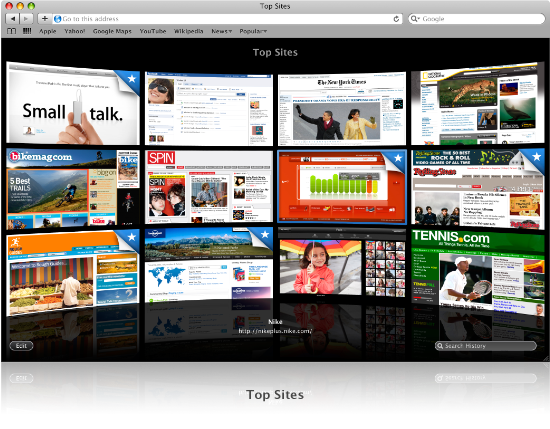 Apple Safari 5 - The fastest, easiest-to-use web browser in the world! ...... Using VoiceOver, you can completely control the computer with the keyboard . You can navigate the web without a mouse. Press the Tab key, and Safari 5 jumps to the next password field, pop-up menu, or input field. For increased keyboard control, you can hold down the Option key while tabbing to have Safari 5 skip through every link on the page. And if you press the Return key, Safari 5 opens the highlighted link, letting you 'point and click' with just a few keystrokes. Convert digital photo and video to AppleTV MP4 files. Qweas is providing links to Apple Safari 5.1.7 as a courtesy, and makes no representations regarding Apple Safari or any other applications or any information related thereto. Any questions, complaints or claims regarding this application Apple Safari 5.1.7 must be directed to the appropriate software vendor. You may click the publisher link of Apple Safari on the top of this page to get more details about the vendor.